Is it redundant to tell people I've blogged? Is that annoying, or is it an accepted practice? How in the world does anyone remember to check to see who's put an "@" symbol in front of your screen name? How do people truly network and find other people on here? Should I be using keywords or buzzwords for other people to find me? What's the deal with hashtags? I knew they denoted a subject, and that people checking on that subject could find you that way, but I didn't know how they could be used, until today. I did one little innocent tweet about how much Ewan was kicking (which, by the way, has been A LOT today). Without really understanding why I was doing it, I added two hashtags to my tweet: #pregnancy and #CHD. I could not have anticipated what was coming. And that's how Kristine Brite found me. 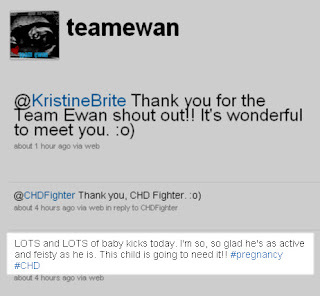 She has quite the following already, and her own experience with having a baby born with a CHD. I was amazed to find such generosity and like-heartedness on Twitter!! She sent me a very sweet note and after checking out her own blog, I knew I had found someone whose support I could count on. This connection has led to others. Simply using the #CHD hashtag has led to still more -- other mothers who, like me, are pregnant with a baby who has a congenital heart defect. Other people who, though not directly impacted by a CHD diagnosis in their own family, still care deeply and want support other families who must walk that path. It's extraordinary that in a medium where the connections made are more likely to be superficial, these are not. It reminds me daily, in more ways than one: we are not alone in this. And neither are they. I'm going to sound like a broken record here, but I continue to be amazed at the power of social networking. Here we were, thinking we were the only ones who had been through this at first. When we started using blogs, e-mail, Facebook, and other social networks, we crossed paths with other people who have been where we are now. Again, amazing. Let that be a lesson to me: use hashtags. Amen. What a cool connection! People who say you can't make "real friends" online have obviously never done it!